A little while ago, my family and I made the huge move from Newcastle to London. It’s been stressful, if I’m honest, but our welcome has been wonderful. I’ve already had the pleasure of visiting a few schools in and around our capital and it’s been amazing. The schools down here are MASSIVE!! Leading to extremely loud assemblies! 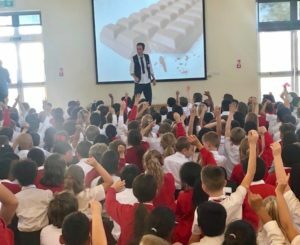 If you work in a school, or know of one in the London area (although I do travel too) and you’d like me to come along and share my silly chocolatey story, please get in touch with Authors Aloud – the lovely people who help me arrange visits. I’d love to visit your school.